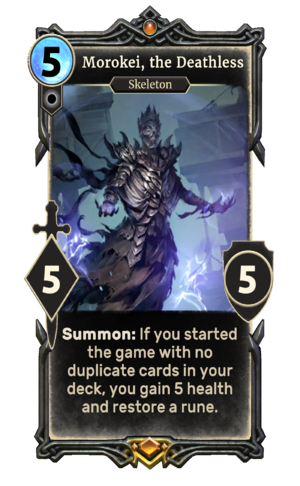 Summon: If you started the game with no duplicate cards in your deck, you gain 5 health and restore a rune. Morokei, the Deathless is a unique legendary Neutral creature card. It is part of the Forgotten Hero Collection. It is available as part of the Forgotten Hero Collection. Morokei first appeared in Skyrim.